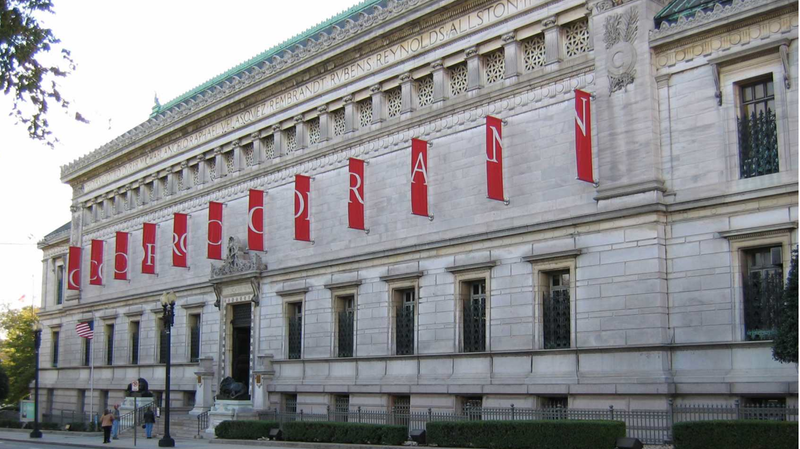 Several articles have appeared recently in the Washington Post about the impending doom of the Corcoran Gallery of Art and the Corcoran College of Art. The most recent article this week by Phillip Kennicott describes the final deal reached between the Corcoran, the National Gallery of Art and George Washington University. From the story, it appears that the Corcoran will cease to exist. GW will assume control of the school and the National Gallery will take over the art collection and the historic building. A sad, sad state of affairs but one a student saw coming over a decade ago. This particular student was returning to school after a career with an international company followed by small business ownership. Though this student was older than the average college student, there were more in the same age group with similar backgrounds. Within the first week of school, the student recognized that some things were not quite right from a business perspective but assumed the constant influx of donor money must cover for the lack of good business practice. The Post article described the management of the Corcoran as having “incompetent leadership,” and “often obscenely inept leadership.” This student is in complete agreement. Though the working- artist teachers in the community education classes were excellent, some of the teachers in the full time student program fell into that description of “obscenely inept.” One particular “inept” action of some teachers of the full time program was to encourage self-expression to the point of anti-social behavior. The teachers called this “artistic expression” and frequently graded work on that basis. This student’s favorite example of how “artistic expression” and anti-social behavior go hand in hand was in the Senior Show. Graduating students were given the opportunity to exhibit work in the museum open to the public of Washington, D.C. It was a great honor. Celebrities and other dignitaries regularly dropped in for the Senior Shows. A group of male students who had been greatly praised for exhibitions of anti-social behavior were given permission to collaborate on their final project. The result was a platform about a foot high and around 10 to 15 feet long built from plywood and covered with green astro-turf. At one end was a large pile of paper airplanes of the kind children make in school out of single sheets of paper. At the other end of the platform was a treasure chest made from cardboard and filled with green pieces of paper decorated with dollar signs. That was the extent of the piece. These students were exhibiting what they had learned after spending four years and sixty-thousand or more dollars on their art education at this supposedly wonderful museum school situated in an historic building in the heart of Washington, D.C., barely a stone’s throw from the White House. This entry was posted in art, art education, art museums, Uncategorized and tagged Museum Art Schools, The Corcoran, The Corcoran Gallery of Art. Bookmark the permalink. A little common sense would be a good beginning!! Practicality and art don’t always mix well!! But it is something artists have to think about for success. I think that there has to develop a body of management people who are truly dedicated to the oeuvre as well as to their jobs, and who can … well, MANAGE ’em! That would be great but where would the salaries come from? Commissions? Most artists are not getting rich anytime soon! Maybe with a manager they could get rich. It’s a thought. I think both is a good idea. But the institutions really should do more instruction on management. The bigger crime is when the 30 cities in Miami Dade County besides the City of Miami proper is the millions they spend on some pipes and forms and shapes(allegedly sculpture) and cut funding for homeless, children care and drug rehab. I agree!! It’s a shame!